As with anything worthwhile, however, there is a price involved. How can a homeowner with a hot tub keep the utility bills manageable from November through February? It’s actually much easier than you might expect, and, when broken down into monthly increments, you could enjoy the benefits of your very own hot tub for as little as a $20.00 increase in your monthly electric bill per that chilly period, a very small price to pay for leisure time warmth. It takes some diligence and homework on your part, but it’s certainly possible. The first thing to note is the age of your hot tub. Unfortunately, if you are the current owner of a hot tub that is several years old, you just might find it more difficult to keep your energy bills in check. The reason being is older model hot tubs are notorious for being energy hogs, even in the summer. There have been tremendous strides in temperature retention and efficiency in recent years from leading brands such as Caldera®, Hot Springs® that utility costs have become less of a factor in hot tub ownership. How Often Will You Use Your Hot Tub? If you don’t currently own a hot tub, you most likely have visions of soaking in the warm waters on a nightly basis. The truth is it’s more likely you will enjoy the soothing benefits of your spa three to four times per week. If you have time to relax more frequently, by all means go for it, but research has shown that four uses per week is the average. That being said, does it make more financial sense to only heat your tub prior to use or to keep it at a consistent temperature? On average it takes 4 to 6 hours to increase the temperature of your hot tub to an optimum temperature. If you tend to act on impulse, you will want to keep the water warm at all times. This doesn’t necessarily mean you need to keep the thermostat set to 102° at all times. Some users have lowered their temperature to 85° and have been able to not only save some kilowatt usage, but keep the water within a range that it can be warmed relatively quickly for use. When it comes to hot tub covers, there is no room to skimp on quality. A well-crafted, insulated hot tub cover will ensure your water stays warmer when not in use. 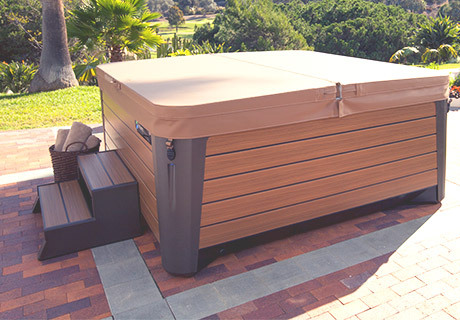 Here at Seven Seas we offer only the best, most efficient spa covers. Don’t believe it when you hear one hot tub cover fits all; you will be disappointed! All of our covers are customized to fit your specific model. Plus, regardless of how large your hot tub is, our covers are all one flat price. If a retailer tells you the cost is based on the size of your spa, please, do yourself a favor and come see us. During any season, it’s imperative that your hot tub’s filter and water circulation pumps are functioning properly. This system keeps the water clean and prepared for use. Make certain that these components are inspected at least once a year to ensure they are operating correctly. Proper implementation of timers can greatly save money on your electric bill year round. Using the example from earlier, you plan on using your hot tub roughly four times a week, timers can be utilized to clean and filter your water during off hours. This enables the water in the spa to be ready for use. Many older hot tubs did not come with installed timers. This has been remedied in all newer hot tubs; however understanding the controls can sometimes be tricky. Our experts will make certain you know how your timer functions in detail so you can reap all of the provided benefits. The most important element in utilizing the least amount of electricity as possible to operate your hot tub is doing your homework. Luckily, we’ve taken the “work” out of that dreaded word offering the assistance and guidance of hot tub specialists, available to answer any of your questions. We can show you energy usage comparisons between all models of the leading spa manufacturers and even provide some other secret tips on how to get the most out of your new purchase. Should I Buy My Hot Tub From a Tent Sale?